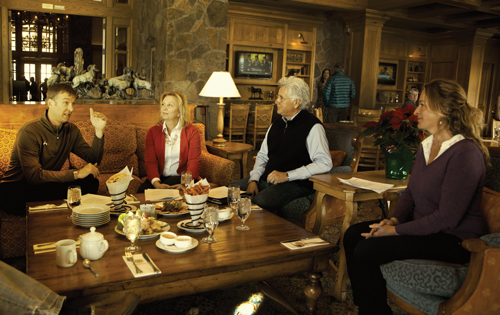 Western Home Journal invited Amy Marx of Idaho Mountain Real Estate to join Sue Radford and Karen Province of Sweetwater Community Realty and Terry Palmer of Sun Valley Associates at the Sun Valley Club to discuss the state of real estate in the Sun Valley area. Since the spring of 2013, Sun Valley has seen an uptick in real estate sales and construction as well as an increasingly competitive rental market. In the south valley, there has been a 28 percent increase in prices. In addition, appraisers are showing an increase of value and stability on homes valley wide. A mix of buyers—first-time, experienced, and second-home owners—are also shopping the market because interest rates are stable, which should hold through 2014. Spec homes are reappearing and, over all, there are 25 new custom-built homes in construction throughout the valley, which has not happened since the recession. Five homes are under construction in the city of Sun Valley all with the prestigious Fairways addresses. The agents agree that throughout the valley, there are great lots to build upon especially to construct new and efficient homes—a trend that appears to be here to stay. All in all, all the agents agree that things are looking up for the real estate market in the Sun Valley area. Here’s a peek at what they had to say. How would you describe the real estate conditions within the Wood River Valley? Have they shifted since last spring? Amy Marx: We had a lot of inventory in the Warm Springs and Ketchum area sell for under a million dollars over the last six months. We’re breaking through to the next price point. Confidence is building with potential buyers, and we’re seeing an increasingly positive attitudes towards real estate overall. The increased local effort towards marketing of the area and air support has, also, built a confidence that we haven’t seen over the last several years. Sue Radford: Low inventory and the increase in prices are sure signs of a recovery. There are buyers waiting and watching the market. It’s good stuff, especially with the interest rates staying low—an integral factor to people seeking loans. In addition, investors have started purchasing properties because there’s such a demand. Karen Province: I think the flights are going to be a huge advantage for real estate sales valley-wide. There is low inventory in the south valley—a change since the spring. Prices have come up, which is good for sellers and interest rates are holding, which is good for buyers. There are a lot of buyers in the game. Terry Palmer: We’re improving from where we were in the spring. Inventory has shifted. There are a lot of reasons to be optimistic—with the Local Option Tax passing and the United Airlines non-stop flight from San Francisco to Sun Valley. It’s all fairly positive. I feel we’re better off now than we were in December 2012. How do the different neighborhood areas and housing types compare as far as desirability to buyers? Marx: Most full-time residents want single-family homes throughout the valley. As that inventory starts to diminish, the condo and townhouse market will start to rise. Radford: There are buyers in all price ranges and looking in all neighborhoods. People are starting to come back to living in town or near the town center. They want to know their neighbors. 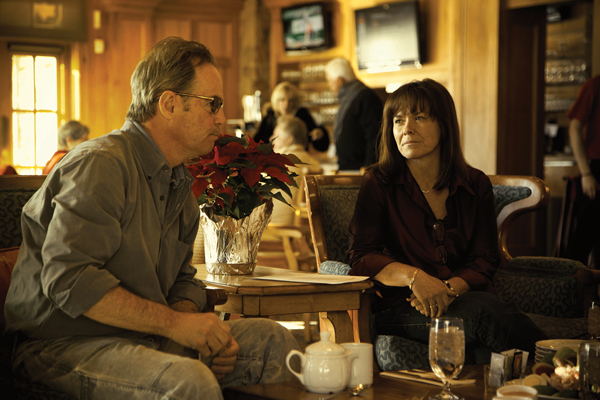 We have the charm of small-town living and the sophistication of culture in larger cities. Province: Energy efficiency is a big deal even in smaller homes. Buyers also want community. Palmer: We’re in need of new product. It seems our clientele is no longer looking for a 10,000-square foot home. It’s more about a 4,000 to 6,000-square foot home. People have learned that they don’t need a huge home. It’s a positive trend. Clients are looking to be closer to town and the amenities. Everything goes in cycles. Presently, families like being in town. What would be your ideal listing for an easy sell this winter in terms of size, finishes, amenities, location, and features? Marx: A newer single-family home in Warm Springs with 3,000-square feet, a main floor master or single-level living unit and green construction concepts would be ideal. People seem to be more realistic about their goals when looking to buy property. Radford: An ideal listing would be a 3,000-square foot home within a median price range of $400,000-$500,000 in Hailey that is a two-story home with a main floor master bedroom close to the river or on the bench. Province: There is a large segment of the population looking for their last home with main floor living and low maintenance. Homes priced under a million with four or more bedrooms at 3,500-square feet would be the perfect listing. It’s in demand. Palmer: We’re lacking new and affordable Warm Springs’ townhomes. Those would be in demand. Do you see lending and available financing as a barrier to sales right now? Do you anticipate this to change? Marx: It’s inevitable that rates will increase. In the past, we had stagnation in condominium sales due to issues with the condo associations needing to take care of problems such as financial viability and/or the need for capital improvements. These problems precluded the project from receiving lender approval and caused any potential buyers to be cash-only purchasers. Most associations have corrected these problems, and that’s been reflected in the increased condominium sales over the last year. Radford: I do not see lending as a barrier. Credit history and credit scores are important factors in being approved for a loan. We’re hearing interest rates are to remain low for 2014. Province: There’s a lot of effort to keep interest rates low, which helps with people looking for loans. There are incentives for the government to keep real estate stimulated and continuing in a positive direction. What strong signs has the market shown over the last six months? Marx: The distressed properties seemed to have been gobbled up. New listings, priced right, don’t stay on the market for long and certain neighborhoods have been in high demand. Radford: As we’ve noted, the market has less inventory and increased prices. Builders are selling spec homes. Communities like Sweetwater in Hailey have sold out and will continue with new construction in the future. Our Internet contacts have increased tremendously—those wanting to be on the ‘automatic’ notification emails. Province: Short sales were the majority of sales and that has changed. Palmer: The south-valley market has been active for a while, which is good. It’s enabling people to buy into the area. Certainly, a year ago is better than five years ago. There are four projects in Warm Springs on Canyon Run, which will all be four to five million dollar homes and all for full-time local families. What is your mix of buyers geographically? Marx: Over the last several years, I’ve primarily worked with people from Idaho, Washington, and California. Radford: I have clients from all over the United States buying and selling, re-sales, new construction, and investment properties. Province: A mix of locals looking to move into larger homes and second-home buyers who have been coming to Sun Valley for four-plus years. Palmer: I feel fortunate. My clients are from all over—San Francisco, Portland, and Seattle. I do have some clients from the East Coast and definitely local families either looking for more space or downsizing. What are the attractions that appeal to people locating here? What is important as far as quality of life, schools, community fabric, non-profits, the resort offerings, trails and open space, and accessibility? Marx: We have seven mountain ranges surrounding us all in an hour and half’s drive—that’s incredible. Radford: The small town atmosphere throughout the valley has been the appeal to my family. The wealth of culture, art, shops, restaurants, activities, and people who keep the fabric of our valley special—all of that’s attractive. Province: Feeling safe is a big draw. People tell me they have started satellite businesses here because the area is so engaging. They go to the grocery store or to the restaurants and people know their names and make them feel part of a community. For someone coming from a metropolitan area, they cannot believe it. Palmer: We are truly blessed with the mountain overlay ordinance. It could be one of the single-best zoning regulations to have ever happened. I moved here in ‘74 and started coming here in ‘69—that’s 45 years. The feeling here has not changed. It’s still very comfortable. The list of what’s attractive about this area is endless—the five mountain ranges that surround us, Baldy, the Bigwood River and its tributaries, The Nature Conservancy and Silver Creek for fishing, The Sun Valley Summer Symphony, The Sun Valley Center for the Arts. The recreational and cultural opportunities are limitless. What is the best kept secret about the Sun Valley home market? Marx: People can enjoy the lifestyle here while working remotely or discover a niche market that they didn’t know existed. Radford: It is a cool place to live, work, and play. Having the billionaires and normal folks intertwined in coffee shops, restaurants, and concerts without the fanfare attached to status. Province: There’s a high level of gratitude here. We have great food, art galleries, festivals, the symphony, and it goes on and on. The culture is amazing for the area. Palmer: This is the greatest mountain town in the U.S. We know it, and people will find it out. Sun Valley, and frankly the state of Idaho, is undiscovered. In a recent article in Men’s Journal, you can read about how in 1936, when the resort was built, the train, “The Snowball Express” was the transportation into the mountains. We now have the airlines to get us into mountain towns. It’s never been easy and that’s why it’s worth it. The value is in the effort. People respect Sun Valley. We’re getting that confidence back. 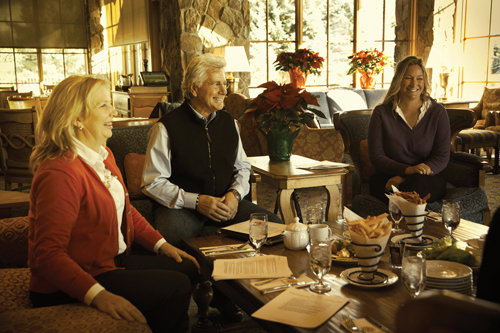 Families can comfortably come here and work out of Sun Valley with ease, if they so choose. Community School and the Sun Valley Ski Education Foundation along with the Sun Valley Ski Academy will all bring in more people as an attractive place to raise children and be able to run businesses. However, I believe balance is the key. We want more people to enjoy what we have; we want to share the Sun Valley experience, but we also must be careful what we wish for. Did the summer’s Beaver Creek Fire affect any potential buyers? Marx: During and after the fire, it was hard on our market to not have the number of visitors that we usually have. This seems to have temporarily slowed real estate sales. But as the fall winds down, we’re seeing an increase of properties under contract. August is also a time when we see a lot of non-profit organizations holding their yearly fundraising events, and the fire deterred people from coming here who may have been able to show some financial support. Radford: August is usually a good sale month; however, people rescheduled to see properties. Province: For us at Sweetwater, the fire was a little blip. People rescheduled with us, but it didn’t impact us. Most people are very educated about fires. It gave us a lot to talk about. Palmer: It definitely stopped business for a month. We’re a resilient area. We’re mountain people, and we have confidence and knowledge of how good we have it. In the ‘70s, ‘80s, and ‘90s, we didn’t worry about fires. Now, it’s about educating and realizing the cycles. Sun Valley’s glass is most definitely more-than-half full.